After getting off to a good start for this year, my cycling too a hit for two weeks. The first week we were out of state to watch the grandkids. We did take our bikes up there but it was cold in Washington State and I didn’t get in that much riding. After I returned to California I did get in a good ride to watch Stage 3 of the Amgen Tour of California, but after that we had 3 days of straight rain. This week the weather has been great and I am back into fully training mode. 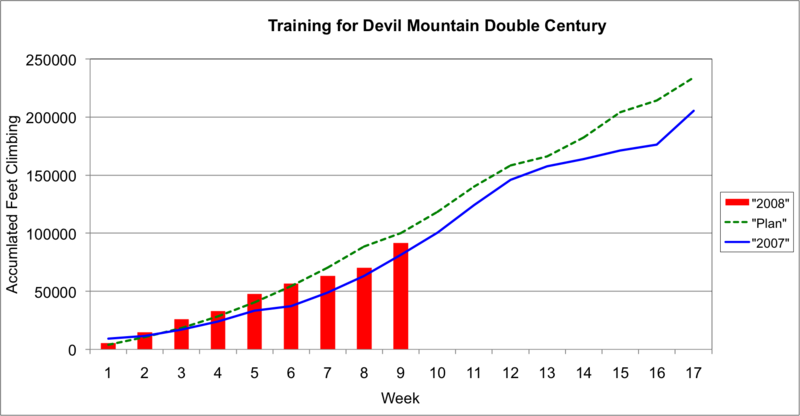 I have been writing an article for the club website on training for a tough double century, called The Big Climb. It is where you combine the long miles of a double century with a lot of climbing, in excess of 15,000 feet. In 2007 I completed such an event last year called the Devil Mountain Double, maybe the most difficult double century in California. Last year it was unusually hot weather and although I finished it was not easy. Having run the Boston Marathon only 12 days early probably did not help either. I am determined to do a better effort at training and have developed a program which I have included in my article. Part of my training for the DMD is to do the Solvang Double Century 4 week earlier. 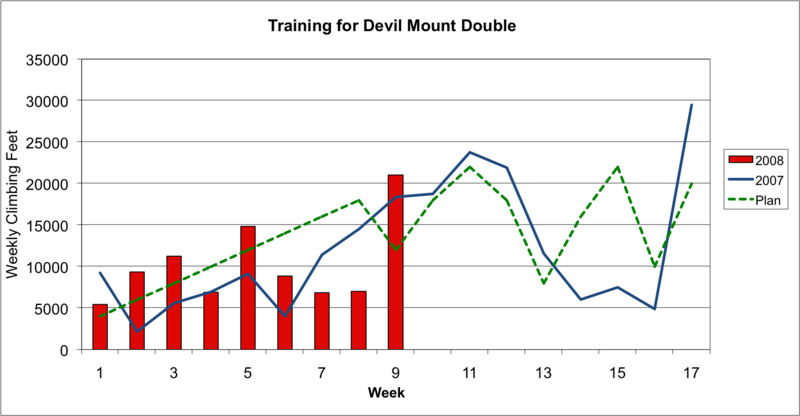 The following four charts track my training for DMD. 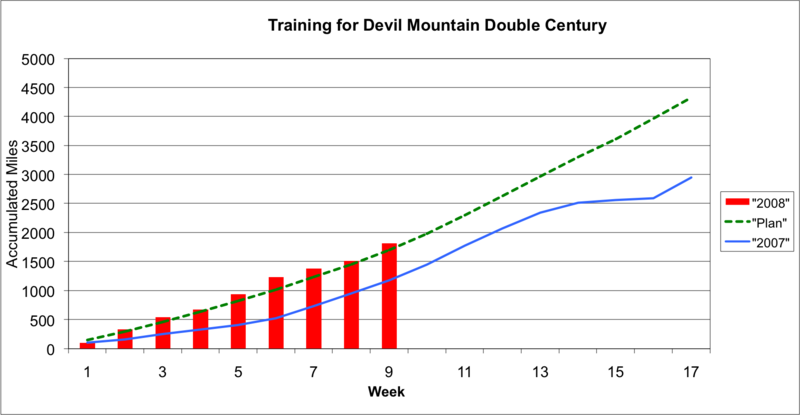 For each chart I plot my training for 2008 compared with both my actual for last year and against my training plan. The first two are accumulated miles ridden and feet climbed. Click all charts to view enlarged. 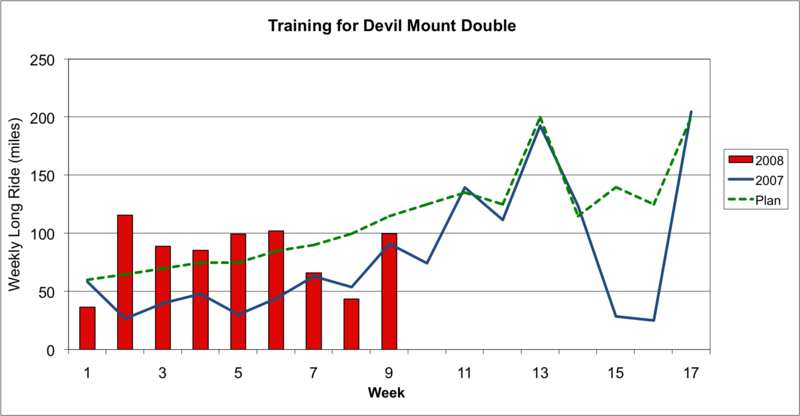 The next two charts show the weekly targets for both the longest ride of the week and the weekly total for climbing. 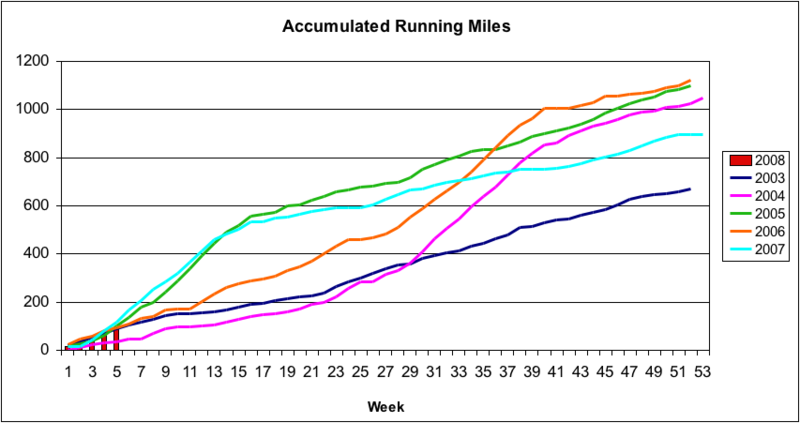 In 2007 the dips from Week 14 to 16 were due to running the Boston Marathon, which made the final training for DMD difficult. That will not be the case this year. Click to enlarge. With the Mega Monster Race 102 miles I was able to almost reach 300 miles for the week and the second week on a row where I exceeded 250 miles. 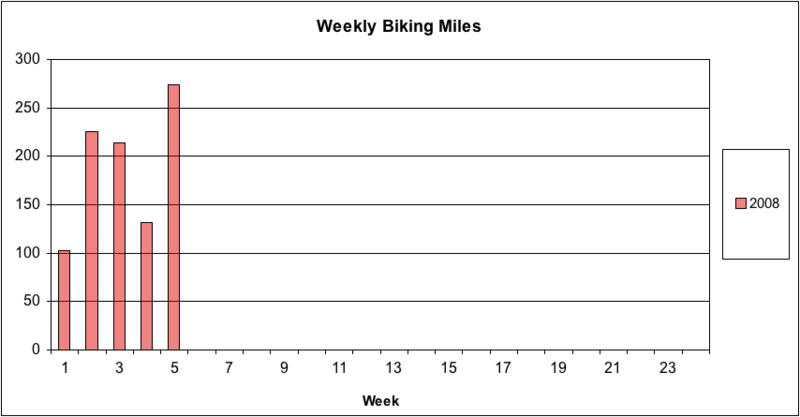 This chart shows my weekly biking miles, getting me ready for the double season. My first double century will be Solvang on March 29th (click to enlarge). Yesterday I competed in a 2008 Mega-Monster Enduro 100 mile bike race as part of a 3 man team with Jim W. and Doug R. We called ourselves the Wheezier Geezers, figuring we might be comptetitive if we narrorwed downt he calissifcation enough that we elminate all other competitors. What other group would there be will all guys over 55 years old? The course started at Paicines and went south on Highway 25 all the way to the end, then back again. We had a total of 101.9 miles and 4,600 feet of climbing. It was a grueling pace, especially with the climbing we had to do. Here are our stats for the four legs. We averaged 19.0 mph rolling with a total time of 5:34:59 and a rolling time of about 5:23, so we only stopped for 12 minutes total. My average heart rate was 150, with a maximum of 164. Despite some rainy weather in California during much of January, both myself and Ann were able to get off to a good start biking and running. I modified my training log so I can keep Ann’s training data in it also. The training log is built using Microsoft Excel and now allows me to select the entry is for either Franz, Ann or Both. When the exercise is selected as Bike-Tandem, then “Both” is automatically selected. Since much of the biking is on a tandem, it makes sense to have one log. Ann did not keep track of all the exercise sessions so far this year, but at least I have the data for the tandem rides, which is most of the biking she has done. I updated all my charts to track 2008 compared with prior years. 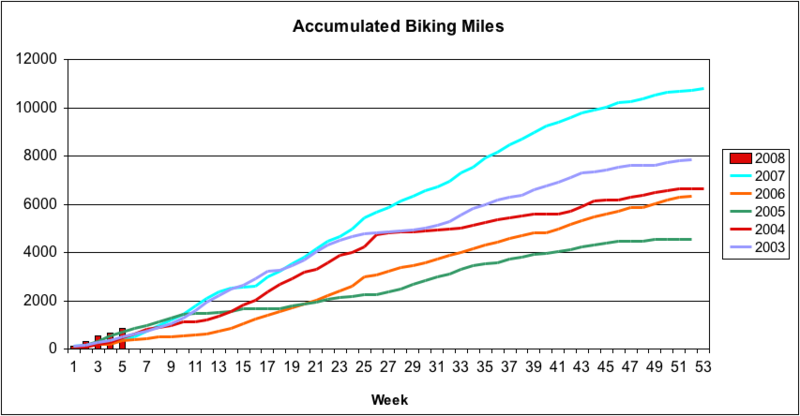 Since it is still early in the year it is hard to see too much of a comparision, but here is the accumulated biking miles. So far this year I have biked 938 miles, compared with about half that many last year at this same time (click to enlarge). This chart shows it on a weekly basis. 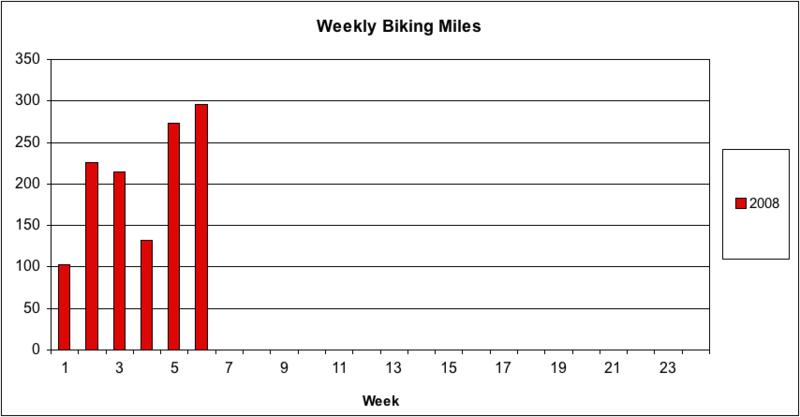 I have exceed 200 miles during 3 of the 5 weeks so far this year, trying to get ready for the upcoming double centuries. Week 4 was with a lot of rain and I only achieved what I did by biking in the rain (click to enlarge). Running has not been quite as strong this year, but still compares favorably with prior years, even 2007 when I was already training for the Boston Marathon. The total for 2008 so far is 87 miles compared with 116 last year. I guess I need to get in gear. With the varying weather I was wondering if anyone would show up for the Long Distance Training Ride scheduled for Saturday, February 2nd. I really didn’t want to miss doing a long ride on Saturday so decided to drive up to the ride start at Landess and Morril. I was a bit surprised that there were 16 riders who also showed up. We all headed out at 8 am under cloudy, but dry, conditions. It was a good opportunity to do the new Old Calaveras Billy Goat. David took off in his normal fast fashion while I was struggling to keep up. The a new rider, by the name of Mike, came up by me. Later I found out he was the fellow who was taking pictures at the Pet the Goat spot on the Devil Mountain Double last year. We then headed up Calaveras and it was David and myself. We were moving fast, up to 27 mph on the flatter sections. Mike caught us after we passed Welch Creek road and then we saw Craig. The four of us plowed on but I was feeling the pain of the fast pace. David them mentioned that he was cutting the ride short and was going to turn around at about 25 miles. I thought, gee I should have let him do ALL the pulling. After David turned back I tried to keep up with Mike and Craig for awhile but after another 5 miles I decided I needed to back off. I was then caught in no man’s land, riding by myself for the rest of the ride. There was some rain, but nothing real heavy, as I was going over the Altamont Pass. Then it cleared while I went up Patterson Pass. On the way back I was biking into a strong headwind, which explained the fast pace on the way out. I kept thinking it would be nice to draft behind big Mike M. but I was not sure how far back the rest of the riders were and I was worried about getting caught in the rain, so I plugged on. It was all bringing back memories of the Devil Mountain Double, but the weather was much cooler this time. On the way back over Calavares it seemed twice as long as on the way out. I finally made it back to the ride start at 3:30, not long before many other riders were returning. I should have waited longer for the train to catch me so I could have drafted with the headwind. Oh well, it was good training, I guess. I ended up with 98 miles and 6,000 feet of climbing.